i finished up my nine patch quilt, i realize it's not a stunning as the larger ones that many have made, but large is not my thing. I actually really like this and may even start making more 9 patches for another, a great way to use up scraps! I pieced the backing with random fabric from my stash, i'm not super happy with it, but it does add to the scrappiness of the quilt. close ups... and the binding, now this was a happy surprise, i don't even remember purchasing this fabric, but i think it works great with this quilt! I think the back is lovely. Good work. Very pretty and I know how hard it is to photograph a quilt and make it look good but you did it! I love your nine patch!It is gorgeous!Just found your blog and I love it! Love the scrappiness of the quilt. The binding is perfect too!! 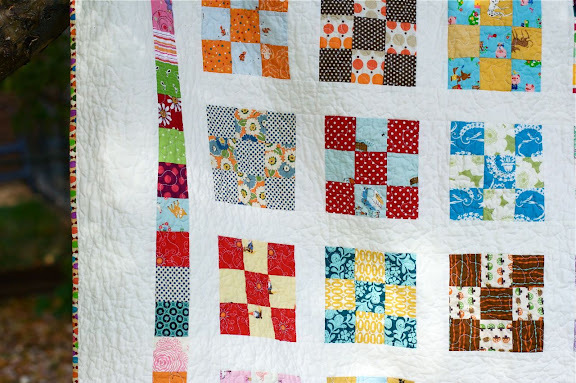 I love scrappy quilts, and this is no exception. Great! Love the binding and the backing. 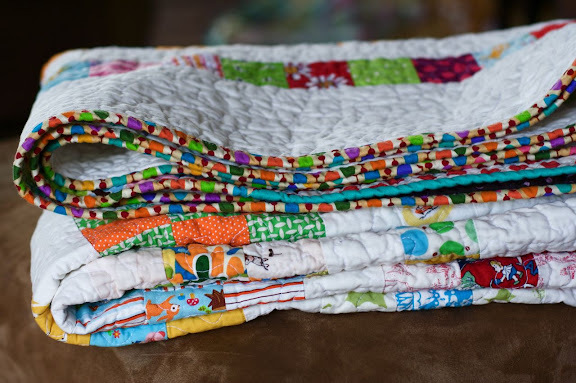 Love the scrapiness of your quilt but especially love the binding. What a great find! What a great looking nine patch. Makes me want to start one too. Your fabrics are great! Those random selections with crisp white. Thank you for the close up pics. Scattered little surprises. That's a happy quilt! gee...I really wish I had that binding! I haven't decided what to put on mine now that I've got the top done. I've also got to find time to quilt it. I was thinking of that "pebble" look (i think that's what it's called). i was out shopping the fabrics stores all day today and didn't even think about looking for something to back and bind with...sheesh....it'll just go on my list of things to look for next time out! By the way, I think your quilt is lovely! Makes me want to hurry up and finish mine! your quilt looks beautiful! i really like the thicker outside border. and i LOVE the binding! 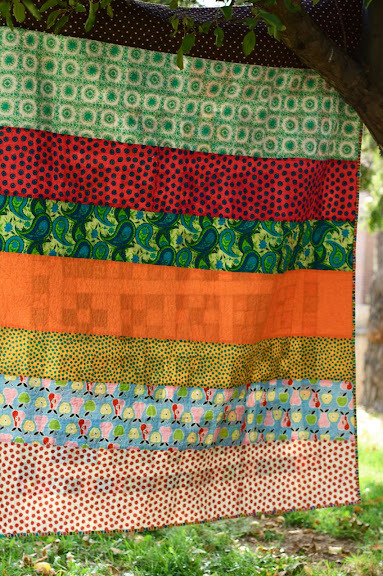 that is such a great print for this quilt! your 9 patch is adorable! i think it's just the right size to snuggle under with a good book! LOL I often find things in my stash that I have no clue how they got there! 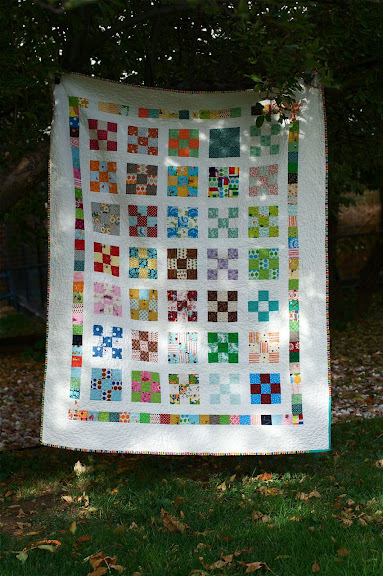 Gorgeous quilt... scraps make such wonderful things sometimes! Just lovely :) Great job! I actually like your size better - the 9 patches are well balanced and I don't feel overwhelmed by my eyes having to dart everywhere to take everything in. It turned out beautifully! SUPER cute! I love 9-patches so much. VERY lovely!!! Well done! I haven't gotten around to starting a nine-patch quilt yet... I need to just start trimming scraps! Yours is such great inspiration! Cheers! I love your quilt and I think the back is great too. 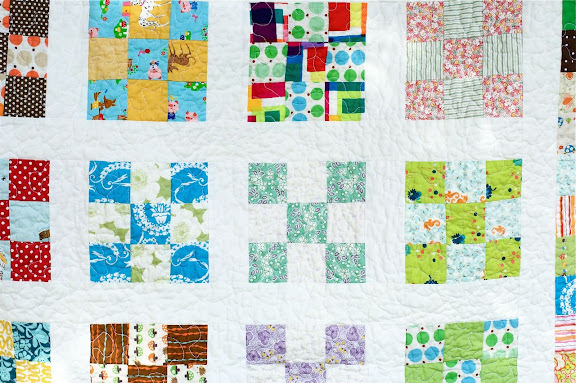 Your quilts are so bright and cheerful. Hope you are feeling well. Any baby news? the binding just wraps it up very nicely. I would love to have that fabric myself. well done, love the white and binding. So pretty, love the colors and the layout of this. I love your nine-patch quilt - just stunning! Your nine patch is perfect - the size, the backing, the binding, all that white with all those scrappy patches - can't get any better than this! Super cute! Love the bright fabrics. I think it turned out great. I love the white background and yes that binding just makes it! I think it's lovely Nettie, you did a great job, and I adore that binding! The quilt is gorgeous and I love the binding! You have inspired me to make one myself. Love it! Love love love! Yay! I have some of the fabric you used for your binding. The quilt is awesome. The humble nine-patch is really fabulous! There is so much to look at and be amused in these small squares. It is a beautiful quilt! Love the backing too. I love how bright and colorful it is! So pretty. I especially love the border- it is unique and beautiful! Oh how I wish I could whip out quilts like you.... I am still working on Claires baby quilt I started when I was 5 months pregnant. I know what you mean about large quilts. Mine came out big and I'm still contemplating how I'm going to quilt it. Your quilt and backing came out great. Oh I think it is stunning! i love the binding too! What a great quilt! I never saw a nine patch so colorful! I like that fabric for the binding. I had some of that and now wish I hadn't gotten rid of it. Beautiful. I love it. It's a wonderful idea to get rid of all of my scraps. I will have to do that. Thanks. it's amazing! that binding is perfect. i love the back, too. It looks very cute. I still need to get mine all put together. Absolutely beautiful! I love both the front AND the back! I like how you balanced the white in the scrappy 9 patches. That makes scraps work, I think, when white or a solid color balances out the scrap. Love this quilt. That binding is PERFECT! Good job. Loving this one....I like the white with the nine patch...I haven't seen any nine patches with white sashing...good choice!! It is beautiful .... perfect in fact. 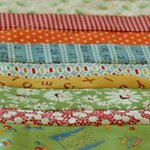 hi Nettie,i've just found your blog and i think that it's wonderful.I can't make patchwork but i'd like to learn how to make it. you're very good at it!!! You are right, this binding adds to a quilt that is soo nice! Your quilts are simply awesome!! so many fabrics I recognize and love! really love the back! It is a beautiful quilt, and a great binding. I prefer the smaller, lap size quilts as well. They are easier to make, and I think they are much more useful. What a great idea for scraps! I have so many as well! Thanks for posting a pic! btw - love the backing! gorgeous! I think I need to try that one! love it! what a happy quilt!! love the 9 patch!! I love this quilt - it is so contemporary with the white sashing. I am not usually a quilter, but I'm starting a lap quilt for my adult daughter and look to your blog for inspiration! HI - been a while, still love you sense of colour and love the clean use of white - these have convinced me to make my second on white exercise, quick and simple design intended for a visually impaired gent that I know.